HOPE – A team from the Environmental and Spatial Technology program at Hope High School presented the Hope School Board with a Hempstead County Bicentennial Year research project Monday night that offers insights into the development of public education in Hempstead County. HHS EAST instructor Adrienne Ware introduced students Jacqueline Culley and Drake Mason, who collaborated with Elizabeth Bamber and Jackson Bowlin on the project for almost a year in developing a final oral history CD and accompanying overview. Ware said the students were approached through the Hempstead County Bicentennial Year Committee to compile the project. 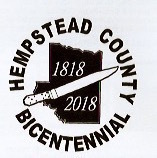 A copy of the project will be included in a bicentennial time capsule that will be buried at the new Hempstead County Courthouse during ceremonies in December. Mason and Culley presented a copy of the project to Board President Willie Buck during the meeting. “Two Hundred Years of Education in Hempstead County” spans the range of public education in Hempstead County from its earliest days in local Roman Catholic Church parish schools to today through a series of oral history interviews and accompanying research. She said the team took two field research trips to the Southwest Arkansas Regional Archives in the Historic Washington State Park to develop a starting point and other critical research. “For this project, we interviewed a lot of people, like former and current Hempstead County educators and other people,” Mason said. In response to questions from the board, Mason said he was surprised to learn of the beginnings of public education in the county through parochial schools. Mason said that he and Culley completed some details of the project after Bamber and Bowlin graduated in May, 2018. The approximately 40-minute CD-based video includes a two-part introduction, 10 individual interviews, and a concluding segment. The video is available through a YouTube at https://youtu.be/v6i9ybhaVnQ online.